It’s November, and that means it is the beginning of our holiday season! It is also National Alzheimer’s Awareness Month. If you’ve been wondering about your brain health or worried about cognitive decline, this is your chance to learn more about dementia and Alzheimer’s disease, and take the right steps to reducing your risk of developing this degenerative brain disease. 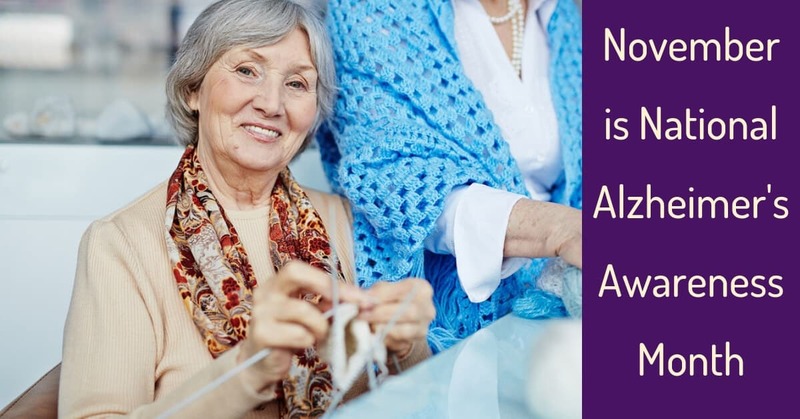 Organizations across the country come together this month to raise awareness of brain health, and provide education and information to those with Alzheimer’s and their families. Alzheimer’s disease is the most common type of dementia, characterized by rapid cognitive decline. It is estimated that today, around 5.4 million Americans have Alzheimer’s, and as the population ages, that number is expected to rise. Sadly, there is no cure for Alzheimer’s or dementia, and it’s among the leading causes of death for older adults in the US. Alzheimer’s disease is caused by an unhealthy growth of proteins in the brain, knowns as plaques and tangles. These clusters of cells interfere with normal brain function, blocking neural pathways and destroying brain cells. Alzheimer’s causes the brain to shrink, and as connections between brain cells continue to weaken, Alzheimer’s affects your ability to communicate, form new memories, recall recent events, learn new skills, or even perform the tasks of daily life like getting dressed or feeding yourself. Many studies have linked hearing loss and Alzheimer’s Disease, and hearing loss has been shown to have a huge impact on cognitive decline. One study from the Johns Hopkins National Institute on Aging found that those with hearing loss are far more likely to experience rapid cognitive decline, opening a path for dementia or Alzheimer’s. Untreated hearing loss leaves you more socially isolated and unable to enjoy life fully. Choosing to say home rather than meeting with friends might sound like a good idea at the time and may save you the embarrassment of answering inappropriately, but you’ll actually be harming your brain. When you lack cognitive input, your brain becomes less active and the cells that you aren’t using regularly are far more likely to be damaged or die. “A lot of people ignore hearing loss because it’s such a slow and insidious process as we age,” explains Frank Lin, researcher at the Johns Hopkins University School of Medicine. “Even if people feel as if they are not affected, we’re showing that it may well be a more serious problem.” Living with untreated hearing loss has more serious implications than you realize. Living with untreated hearing loss increases social isolation, and many seniors with hearing loss struggle with loneliness, depression, and other mental health concerns. When you’re unable to have a normal conversation, or have to ask people to repeat themselves many times, it’s difficult to maintain close relationships, and you and your loved ones will often get frustrated when trying to communicate. You can still follow conversations in the quiet of your own home, but large groups, or places with a lot of background noise have become impossible for you. If you’ve stopped going out to meet with friends, or choose to stay home rather than going to the park with your grandchildren, your quality of life is reduced, you’ll experience crippling social isolation, and increased cognitive decline, and may increase the risk for developing dementia and Alzheimer’s disease. Rather than living with untreated hearing loss and risking rapid cognitive decline, it’s time to consider treating your hearing loss. As the holiday season approaches, think about how wonderful it would be to participate in the family dinner and enjoy listening to stories flying around the table. You want to connect with your grandkids and maintain a healthy relationship with your children for years to come, and treating hearing loss paves the way for this connection. This November, do the right thing for your brain and your most important relationships, and visit us at Pacific Northwest Audiology for a hearing test. We’ll help you learn more about your hearing loss and hearing health, and give you tips on how to keep your brain active and healthy. We’ll also help you choose the perfect hearing aids that will have you hearing clearly, participating in conversations, learning new things, and enjoying life to the fullest.